Hurray For The Riff Raff performs at World Cafe Live in Philadelphia. Hurray for the Riff Raff has always been a voice for the underdogs and the outsiders, and the band delivers that spirit in spades on a new, rousing album called The Navigator. It's based on a fictional character named Navita, whose journey mirrors the one taken by courageous band founder and songwriter Alynda Segarra. She left home at 17 to hop trains, busked on the streets of the Big Easy and made a lasting impression a couple years ago with a well-loved, New Orleans-influenced album called Small Town Heroes. The Navigator sees Segarra leaving the sound of her adopted home in the South to trace the musical texture of the Bronx (where she grew up), the Puerto Rican identity of her ancestors and the personal politics that she's passionate about right now. "This album is like my life if you put a Wizard of Oz filter on it," she says — and if the soundtrack was scored by a doo-wop, jazz, rock and gospel band of rag-tags from New Orleans. 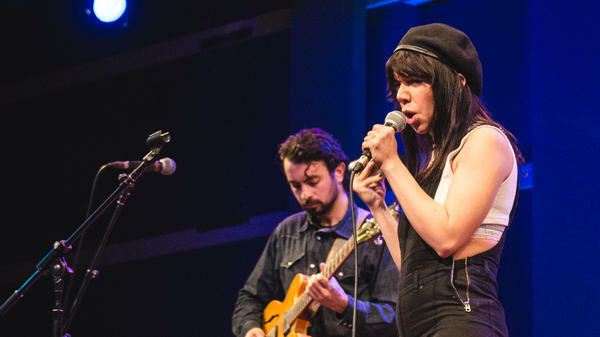 Hear the complete session above and watch Hurray for the Riff Raff perform "Rican Beach" at World Cafe Live below.